Animosity is the type of thing that only grows strong with time. It festers and builds. Given enough time, it takes on a personality of its own. The first release from King of the Dot’s latest event, Flatline, was an exercise in pent up hostility. LA’s Dizaster and New York’s DNA have been waiting for the chance to face off with each other for close to a year, after a series of unfortunate cancellations delayed their battle from its originally planned date. When KOTD stepped in to make the long awaited struggle happen, the hype machine kicked into overdrive. 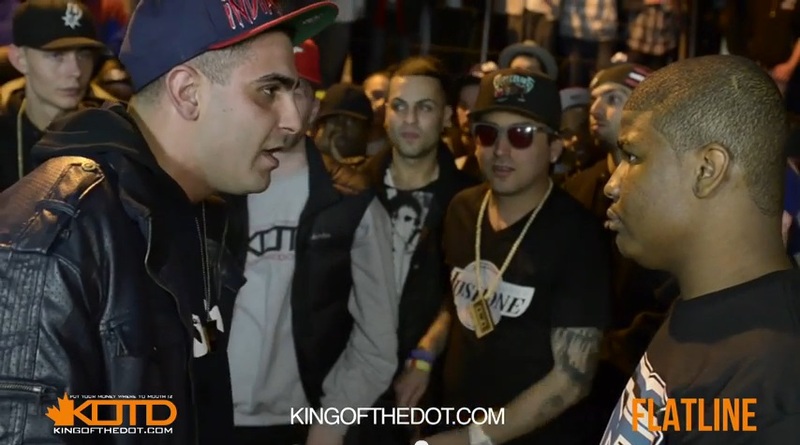 Co-hosted by none other than Toronto’s own Drake, who put up $3000 of his own money for the battle on the spot, this epic showdown was an instant classic. A marathon display of punches and personals, nothing was held back as Diz and DNA went for the throat with nearly 40 minutes of material between the two of them. As for the winner? That’s for the fans to decide, as this battle marks the second round of KOTD’s So You Think You Can Judge competition which asks fans to record a video response giving their opinion on the battle. The responsibility is in the hands of the fans to decide – who came out on top in this highly anticipated and hugely exciting headline event? This entry was posted in Dizaster, DNA, King Of The Dot and tagged Battle Rap Lyrics, classics, dizaster, Dizaster vs DNA Lyrics, DNA, DNA vs Dizaster Lyrics, king of the dot, Rap Battle Lyrics. Bookmark the permalink.